Stink bugs are invading New England homes this fall. The air is becoming crisp and cool which is a sure sign of fall for New Englanders. But as you settle in this fall with your pumpkin carving and apple pie baking, make sure that you are taking note of any invading bugs. Among the many fall pests that can access your home, stink bugs are in full force this year invading homes in Maine, New Hampshire and Massachusetts as well as throughout New England. If you are not careful you could share your home with these odoriferous pests. According to the National Pest Management Association, due to a nice warm summer, stink bugs have had a chance to really grow their populations. Experts are estimating more cases of stink bug infestations in homes this year in New England and across the country compared to last year’s numbers. And since the fall months are prime time for these pests, it is a good idea to become aware of what stink bugs are, why they have a smelly reputation and how you can prevent them from getting into your home. Stink bugs are known for their shield shaped body and true to their name, they emit a foul smell after feeling threatened or getting crushed. They do not pose threats to humans or homes but they can infest your home in high numbers which makes them a major nuisance pest. Entomologists have reported seeing homes infested with hundreds and even thousands of stink bugs…Yuck! Inspect the exterior of the home and seal off any holes or cracks. Make sure windows and doors are properly sealed as well. Fill in gaps from utility openings that could be used as an entry point. Inspect the interior of the home including hidden spaces like attics and basements and if you do happen to find stink bugs or any other bugs around the house then it’s time to call in the pest control pros! Since these pests are looking for a place to spend the winter, they are not going to leave on their own anytime soon. And with the potential for such high numbers of stink bugs, it’s always best to have a pest managment professional find the best solution for your home. 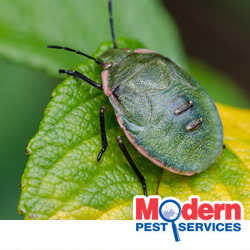 To learn more about how to remove stink bugs in Maine, New Hampshire and Massachusetts, simply contact Modern Pest Solutions. With pest solutions designed to get rid of existing infestations and prevent new ones from occurring, you can trust that your home will be in good hands so you can get back to your fall festivities!